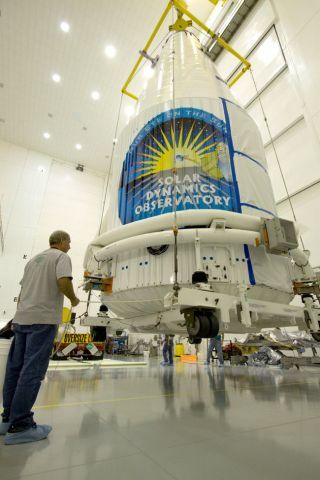 NASA's newest sun probe, the Solar Dynamics Observatory(SDO), will have to wait at least one more day to launch on its quest to studyour star. The new observatory was slated to lift off Wednesday morningfrom Launch Complex 41 at Cape Canaveral Air Force Station in Florida, but strongwinds stymied the launch. NASA will try again to loft the solarspacecraft atop its Atlas 5 rocket on Thursday at 10:23 a.m. EST (1523 GMT),when a more optimistic 60 percent chance of good weather is predicted. "The weather has not been kind so far to SDO," saidU.S. Air Force Maj. Christopher Lovett, the launch's weather officer. The $850 million mission is designed for a five-year run tocontinually observe the sun to learn more about its magnetic field and volatilesolarweather. "SDO is the most advanced spacecraft of its type everdesigned and flown," said Michael Luther, deputy associate administratorfor programs at NASA's Science Mission Directorate. The probe will gatherhigher quality data at a faster rate than any previous study of the sun, hesaid. "We're all very excited about finally getting SDOup in the sky where it needs to be," said Stanford University scientistPhil Scherrer, principal investigator of SDO's Helioseismic and Magnetic Imagerinstrument. Visit SPACE.com for launchupdates and complete coverage of NASA's Solar Dynamics Observatoryfrom Staff Writer Clara Moskowitz in New York.